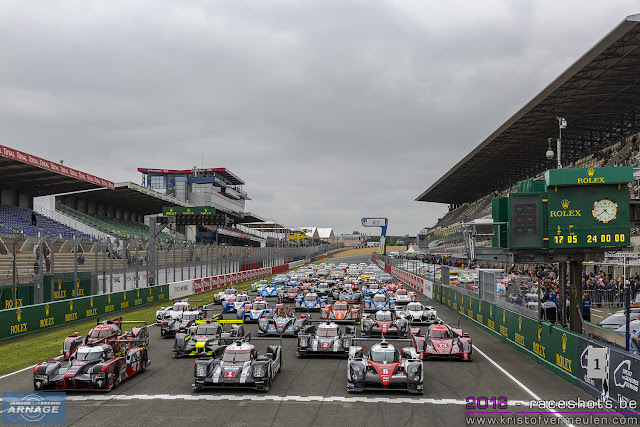 The Automobile Club de l’Ouest, creator and organiser of the Le Mans 24 Hours, has revealed the official list of the 60 cars and full driver line-ups who will take part in the pinnacle of the FIA World Endurance Championship on 17 - 18 June. While many teams had already communicated their drivers for the different Le Mans-type championships, they had until 11th May at midnight to send in the final line-ups for the Le Mans 24 Hours. After carrying out the usual checks, this list now has been officially revealed today by the ACO. The last announcement came from Toyota as Argentinean José-Maria Lopez, who was initially down to drive no. 7, has moved across to no. 9 and exchanged his seat with Stéphane Sarazzin. The only team which has not yet finalised its third driver is Proton Competition entered in LM GTE Am. The Mentos-Proton Racing Porsche 911 RSR is the only car remaining on the reserve list, should there be a last minute withdrawal from the race by another team. The 179 drivers which have been announced so far have licences issued by 31 different countries, and the 60 cars represent 41 teams and 16 nationalities. Cars running under American licences are the most numerous, while France and Britain supply the most drivers with 34 each. This year there will be only one woman driver at the start, 25-year-old Christina Nielsen from Denmark, back for her second outing in the Le Mans 24 Hours in the Scuderia Corsa Ferrari 488 in GTE Am. The list of entrants breaks down as follows: 6 cars in LM P1, 25 in LM P2, 13 in LM GTE Pro and 16 in LM GTE Am. Mentos Proton Racing is still on the reserve list should one of the official entries withdraw. We will take a closer look into the entry list in the run up to the 24 Hours of Le Mans.